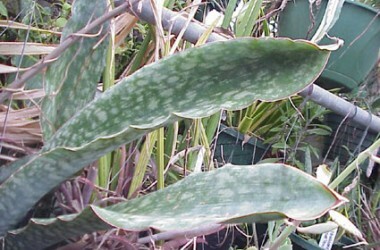 The dramatic foliage sports a pellucid glaucous surface "bloom." This is Chahinian's clone (which seems very very close to Grigsby's "Special Clone" or "Super Form") which will eventually produce prodigious large thick leaves far more erect than the other species forms with a ghostly surface tone and paperlike edge. Slow to establish but worth the wait. 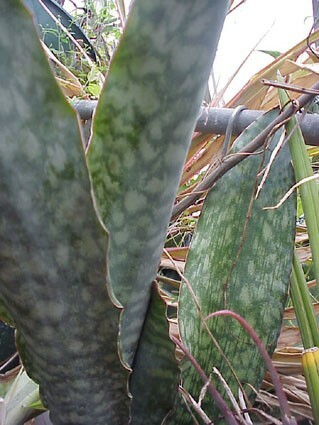 The foliage is not pink; the seldom produced flower is. 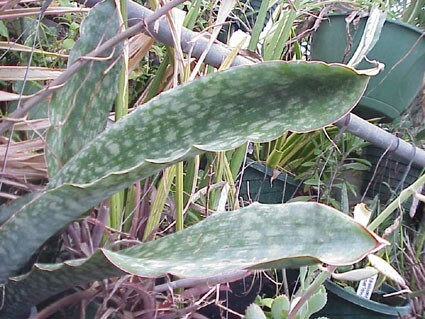 But the foliage is very distinctive and different from the other Sansevieria kirkii clones. In short supply at times due to the continued high demand for this impressive creature by Asian collectors.